WALNUT OIL – extracted from walnuts. Rare ellagic acid, a UV antioxidant, fights wrinkles in mature skin. Omega 3 causes it to be anti-inflammatory to eczema and psoriasis. 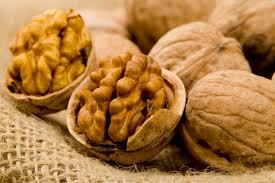 Walnut oil, high in proteins, is found in anti-aging eye creams, to restructure the cell. Counteracts fungal infections such as athlete’s foot and thrush. Pour this oil over your food, for a nutrient-rich addition.